Why do I care? The Coriolis Effect contributes to the circular motion of the wind around pressure systems which move weather patterns in the southeastern United States. The Earth rotates at a high speed counter-clockwise as viewed from the North Pole. 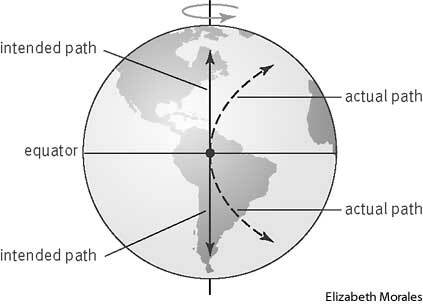 If an object starts at the North Pole and moves toward the equator in a straight-line path, for example, the object will appear to deflect to the right of its intended path because the earth is rotating under it as it moves. This is called the Coriolis Effect. If the earth did not rotate, an object would continue on a straight-line path without appearing to deflect at all. The amount of deflection varies with latitude, the speed of the object and the rotation of the earth. The deflection is greatest at the poles and decreases to zero at the equator. The Coriolis Effect can be seen in action in the general circulation of the atmosphere. The winds at all latitudes to the north of 0° deflect to the right of their intended path in the Northern Hemisphere. The Coriolis Effect does not impact the wind speed, only the wind direction. The Coriolis Effect impacts objects on a large scale and does not generally have a big influence on small scale objects at the earth’s surface. Though hurricanes are small scale compared to the overall globe, hurricanes need the Coriolis Effect to help develop the circular motion of their circulations. Tornadoes are not impacted by the Coriolis Effect because they are so small in scale and short in duration. The direction water goes down the drain is also not impacted by the Coriolis Effect.